Keep your attendees on the right track! Host as many maps as you need inside of the event apps. They can be maps of an online service such as a Google Maps or Bing Maps. 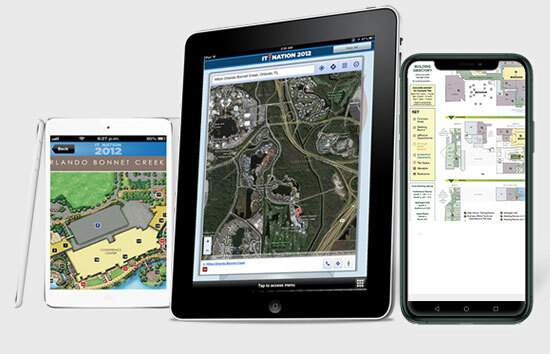 They can also be static images of maps that you can upload such as jpg images or maps in pdf files. 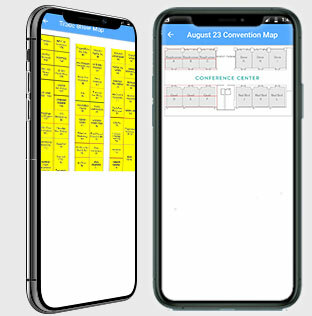 Make your static image maps interactive by connecting your session or exhibitor information to them via the content management system (CMS). 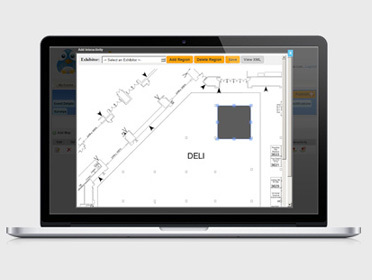 Simply upload an image map file and then start drawing boxes on it from inside our web based CMS. Each box can correspond to one or more sessions and exhibitors. Make edits to these boxes at any time and release those changes to your attendee users. Viewing an exhibitor map for instance will show you a map with a colored box around the spots where the exhibitors are located. Tap on the colored boxes to get details about exhibitors in those locations. Visiting the same map from the exhibitors section will actually drop a pin on the exhibitor's location.